ZTE today announced the Blade V8 Mini and the Blade V8 Lite, two low-spec'd devices that will sit under the Blade V8 Pro released earlier this year. The phones share a number of features, including metal designs, rear-mounted fingerprint sensors, 5-inch HD displays, 2 GB of RAM, and 16 GB of storage. They both run Android 7 Nougat with ZTE's MiFavor 4.2 UI. Blade V8 Mini: The Mini (pictured) is the more capable of the two phones thanks to its octa-core Qualcomm Snapdragon 435 processor. It features a 13- and 2-megapixel main camera combo for advanced features such as bokeh and 3D depth shots. The front camera has a 5-megapixel sensor and its own selfie flash. The fingerprint sensor supports a handful of gestures for answering calls and such. The V8 Mini has a 2,800mAh battery. Blade V8 Lite: The lesser of the new ZTEs includes an octa-core MediaTek 6750 processor. The V8 Lite has an 8-megapixel main camera, a 5-megapixel user-facing camera, and a 2,500mAh battery. Both phones are expected to ship to Asian and European markets during the second quarter. For now, the Blade V8 Pro will be the only Blade handset sold in the U.S., according to ZTE. 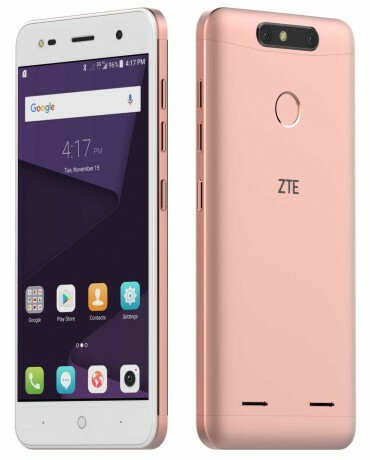 ZTE Brings Two Low-Cost, Unlocked Phones to the U.S.
ZTE is taking its first, cautious steps in staging a comeback in the U.S. market with two entry-level phones that can run on Sprint, Verizon, and GSM networks. ZTE and MetroPCS today announced the Blade Z Max, a successor to last year's Z Max smartphone. ZTE is making greater use of its Blade branding on value handsets in the U.S., which is why the new phone adds "Blade" to its name. I hope that ZTE comes out with the sequel to the Axon 7 flagship.